Clearwater Beach day plus Awesome Speed boat ride. We provide transportation to Clearwater Beach, one of the most beautiful white sandy beaches in Florida. 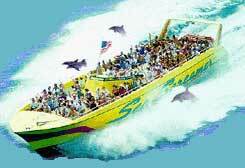 Come ride the open waters on America's Largest Speed boat in the beautiful Gulf of Mexico! An Awesome 1 Hour boat ride on the Sea Screamer! Clearwater's most exciting family attraction for all ages. Enjoy 2 boat rides in one in this unique speedboat! Enjoy a cruise of Clearwater Harbor and Pass, Clearwater Beach and Sand Key Park narrated by our friendly, knowledgeable captain exploring for Dolphins. 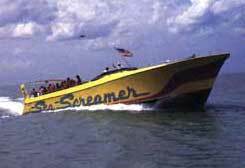 Then.. thrill to a refreshing, exhilarating ride in the open water of the Gulf of Mexico, screaming past Clearwater's famous beaches and resorts. An experience you'll never forget! Then spend the afternoon on the beach topping off your tan, playing volleyball, or collecting sand dollars! This fabulous trip includes transportation & a picnic style box lunch. Watch out for the wild dolphins that leap in and out of the wake as you make your way up the coast. This is a one day excursion departing from Orlando Florida. This excursion requires full payment upon time of booking. 20% + e voucher policy.